Should I Pay My Car Inside Or Outside Of My Chapter 13 Bankruptcy Case? You are here: Home / Chapter 7 Bankruptcy / Should I Pay My Car Inside Or Outside Of My Chapter 13 Bankruptcy Case? There are many ways to treat a vehicle when filing chapter 13 bankruptcy. Not one answer fits every case. In fact, the answer is going to vary depending upon whether or not the debtor is current on the vehicle, whether the vehicle was purchased within the last two and half years, and whether or not the debtor needs to restructure that debt in essence. Let’s examine the first scenario. If the debtor has a vehicle purchased within the last two and half years and he is current on that vehicle, then I would recommend that he continue to pay for that vehicle outside of the chapter 13. By doing so, he will avoid the interest rate that the trustee charges as an administrative expense on his case. He also has shown the ability to make current payments so there really is no need to reorganize that debt and incur an additional fee. 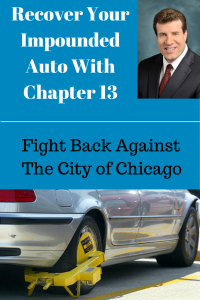 If the debtor is behind on his vehicle payments and subject to repossession, then obviously we want to pay that vehicle back through the chapter 13 no matter what the administrative expenses are. The debtor needs the vehicle to get to and from work and to provide for himself and his family. In those situations we do whatever we can to reorganize that debt inside of the chapter 13 bankruptcy case. Let’s talk about a situation where the vehicle was paid in full and then the debtor went out and obtained a title loan on it. In this scenario, the title loan is known as a non-purchase money security interest. This means that we are able to treat the vehicle at market value instead of the total amount necessarily owed to the title loan company. In these scenarios, we want to put the vehicle inside the chapter 13 and repay the market value plus market interest not the interest on the actual loan documents. This is where it gets a little bit complicated and we rely on expensive software to give an estimate of what the debtor will pay for that particular vehicle through the plan. There are other scenarios where the vehicle may be co-signed. In those situations, if the debtor wishes to protect the co-signer, then we need to pay that vehicle back in full at the contracted rate of interest. If the debtor is not interested in protecting the co-debtor as in the case of an ex-boyfriend or ex-girlfriend, then we can treat the vehicle to a lesser extent knowing however that the creditor does have the right to pursue the co-signer. As you can see, the way and method in which we treat vehicles depends upon a number of different factors. Most importantly, is the debtor current on the vehicle and is it a recent purchase? Secondly, was the vehicle purchased within the past two and half years or beyond the past two and half years? Thirdly, is there a co-signer on the debt? Also, was this vehicle paid for and that a loan obtain or is this a purchased money security interest? All these factors need to be analyzed and discussed with the client to determine whether or not that vehicle should be paid inside or outside the chapter 13 bankruptcy case. The amount that the debtor pays depending upon which scenario we file under can make a significant difference in the total amount paid over the life of the case.